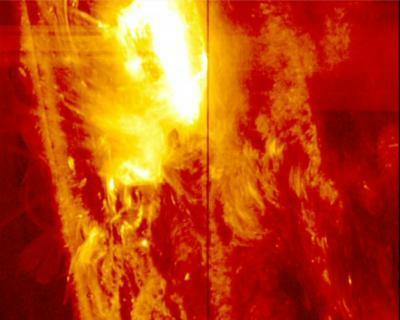 The Interface Region Imaging Spectrometer (IRIS) mission studies the chromosphere, that layer of the sun's atmosphere that is key to regulating the flow of energy and material as they travel from the sun's surface out into space. 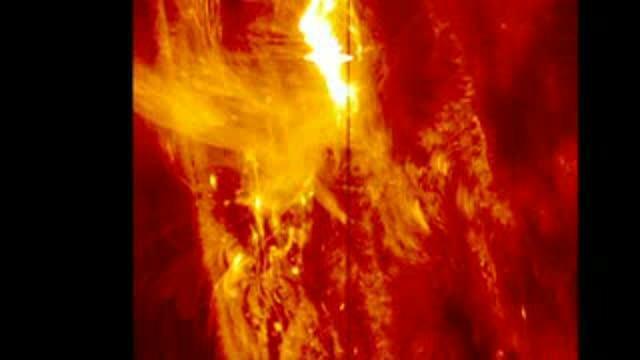 Along the way, the energy heats up the upper atmosphere, the corona, and sometimes powers solar events such as this flare. IRIS is equipped with a spectrograph that can separate out the light it sees into its individual wavelengths, which in turn correlates to material at different temperatures, velocities and densities. On January 28th, the spectrograph on IRIS was pointed right into the heart of a flare when it reached its peak, and so the data obtained can help determine how different temperatures of material flow, giving scientists more insight into how flares work. The IRIS mission is managed by the Lockheed Martin Solar and Astrophysics Laboratory of the ATC in Palo Alto, Calif. NASA's Ames Research Center in Moffett Field, Calif., is responsible for mission operations and the ground data system. The Ames Pleiades supercomputer is used to carry out many of the numerical simulations that are led by the University of Oslo. The IRIS telescope was designed and built by the Smithsonian Astrophysical Observatory while Montana State University faculty and students assisted in the design of the spectrograph. A large volume of science data is downlinked via Kongsberg Satellite Services, (KSAT) facilities through a cooperative agreement between NASA and the Norwegian Space Centre. NASA's Goddard Space Flight Center in Greenbelt, Md., oversees the Explorers Program from which IRIS evolved.